CenterPoint Payroll Software can handle the needs of a growing business, with multi-state payroll, unlimited and customizable earnings and deductions, and more ways to pay employees. Software by Red Wing Software, Inc. If you are accustomed to using in house payroll and are looking for a good software. I highly recommend Center Point Payroll. The Aatrix solution for tax filing is terrific. Ability to do direct deposit for checks, and the Aatrix tax form preparation feature. Ability to do direct deposit for checks, and the Aatrix tax form preparation feature. Still waiting for a time and attendance partner solution. Thank you so much Robyn for the wonderful review! We appreciate having you as a customer! I will check into the status of the partner solution you mentioned and get back to you. It is very easy to use and understand, and i absolutely LOVE the support personnel! Very easy to work with, and if they dont know the answer to my problem, they keep digging until they can fix me and my issues...... Support personnel!!!! Carla, thank you so much for the wonderful review of CenterPoint Payroll! I am glad to hear that you love the support team, and that support is able to help you get any issues solved. Thanks for taking the time to write this review. We are grateful to have you as a customer! In 2013 we switched our accounting system to a "shop system" which did not come with a payroll package. The "shop" system was a nightmare but they recommended CenterPoint payroll and I have been very pleased with the ease of use and the support I received getting it set up. I like it very much.Ease of use. When I have had to call support they have always been able to answer my questions and are very pleasant. Ease of use. When I have had to call support they have always been able to answer my questions and are very pleasant. I have not figured out how to eliminate inactive employees from the employee list when running a new payroll but I have not taken the time to call support to see if there is a way because I only have three. Wow, Jane, thank you so much for taking the time to write this glowing review! It is great to hear that you are loving CenterPoint Payroll. Whenever you are ready, just give our support team a call and we will help you figure out the inactive employees. Thanks again! I have found CenterPoint Payroll a very good solution for easily producing payrolls and tracking the information we want to see in our business.CenterPoint Payroll allows me to pay my employees, keep track of specific information about fields worked in, equipment used, department tracking, etc. It stays current with tax changes and allows deductions and has a variety of reports to mine information for tax reporting and payments and business analysis. CenterPoint Payroll allows me to pay my employees, keep track of specific information about fields worked in, equipment used, department tracking, etc. It stays current with tax changes and allows deductions and has a variety of reports to mine information for tax reporting and payments and business analysis. Unless I've missed it, I can't change the order the checks print in. Thank you so much for your review, Frieda! We appreciate your response. I checked with our support staff, and you can definitely change the order the checks print in. If you call support, they will show you how. Thanks for being a Red Wing Software customer! it's a comprehensive flexible program that lets you personalize it many ways. However, personally I have an issue I have not been able to resolve (even after contact with the support group...) . I need the program to calculate a garnish with a limit of 65% of NET pay... it seems no matter what I do it calculates 65 % of GROSS pay. (Frustrating!) Comprehensive. You can setup a garnishment to calculate as a percentage of net pay by using the type="garnishment" on the deduction setup. On the employee's setup in the rate, you would enter the percent (65%), which would be the limit - it will never take more than 65% of net pay for the garnishment. Using the garnishment type for the deduction also allows you to set up a dollar amount limit (in the "up to amount" cell) and a minimum of net pay. So if 65% doesn't allow the employee to have enough "take-home" pay the deduction can be stopped before it reaches that percentage. I hope this helps! If you would like more information, our support team will be happy to help you. Thank you for doing this review and for being a Red Wing Software customer! 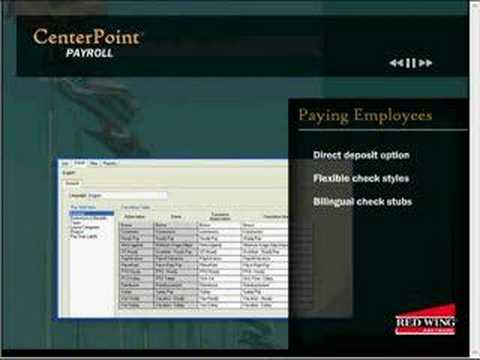 If you are outgrowing a basic "shelf" payroll software, CenterPoint is an excellent option. Whether you need more ways to pay employees, manage payroll for multiple states, or to pay employees beyond the basic calculations, CenterPoint can handle it. CenterPoint offers many customizable options, and the unlimited storage of data. Below are some frequently asked questions for CenterPoint Payroll Software. Q. What type of pricing plans does CenterPoint Payroll Software offer? Q. Who are the typical users of CenterPoint Payroll Software? Q. What languages does CenterPoint Payroll Software support? Q. Does CenterPoint Payroll Software support mobile devices? Q. Does CenterPoint Payroll Software offer an API? No, CenterPoint Payroll Software does not have an API available. Q. What other apps does CenterPoint Payroll Software integrate with? Q. What level of support does CenterPoint Payroll Software offer? Q. Which apps is CenterPoint Payroll Software compared to most often?